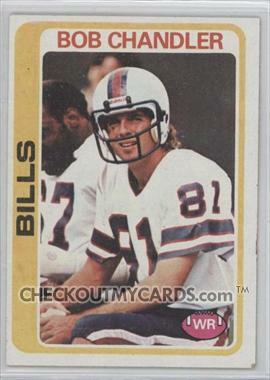 1978 Topps football card, from www.CheckOutMyCards.com , of former NFL receiver Bob Chandler. Chandler played 12 seasons in the league, mostly for the Buffalo Bills, and gained a reputation as a sure-handed receiver with the Bills in an era when the team mostly featured the running of O.J. Simpson. He finished his career as a Los Angeles Raider, winning a Super Bowl there following the 1980 season. Chandler dabbled in broadcasting when his playing days ended, working as an analyst on NFL games for NBC in 1983, and on the Raiders’ radio broadcasts. He died at the age of 45 after a long battle with lung cancer in1995.